It all started with a sketch. 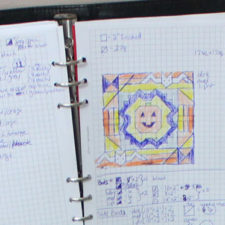 I originally wanted to make a larger quilt as pictured to the right in my sketch. It had a centre medallion with bats on each corner with an ombre style border. I cut out all the fabrics but I wasn’t loving the bats after all. I decided to focus on the pumpkin only and I’m really glad I did! 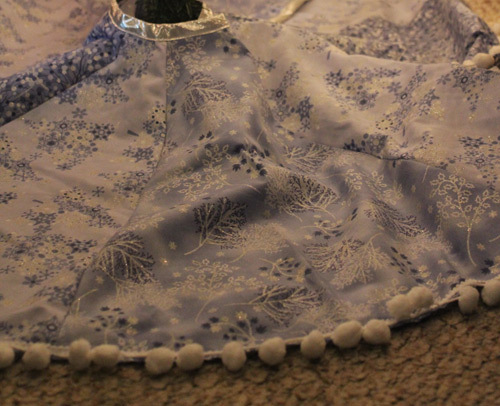 This wall hanging will end up being 22″ x 22″ finished. 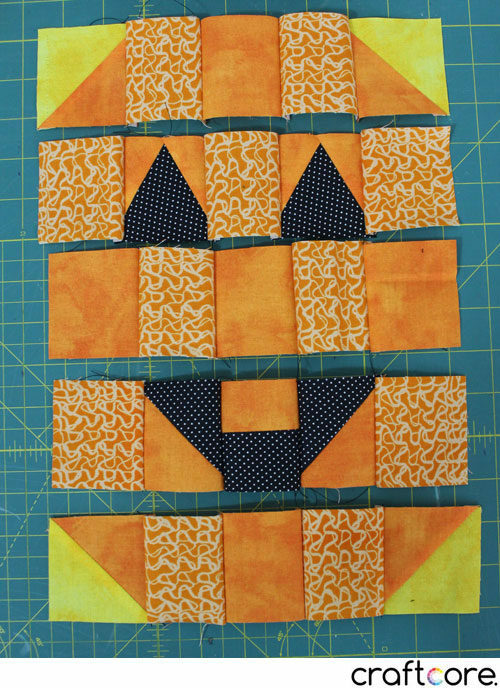 Cut out 11 2.5″ squares from the orange patterned print. Cut out a 1.5″x2.5″ rectangle from the orange patterned print. Cut out a 1.5″x2.5″ rectangle from the black fabric. 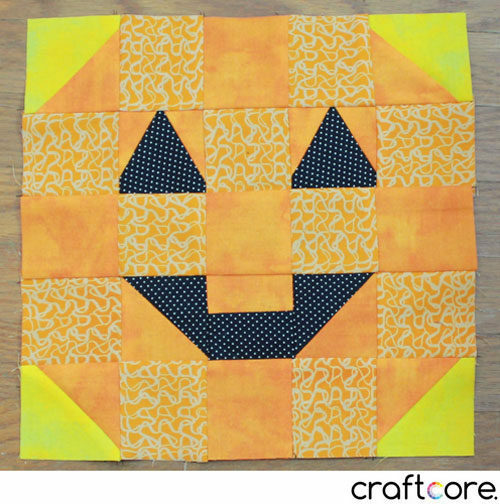 Cut out 5 2.5″ squares from the orange solid fabric. 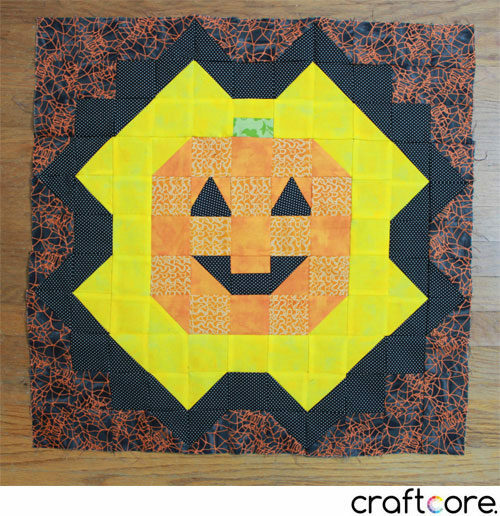 Cut out 3 2 7/8″ squares from the orange solid fabric. 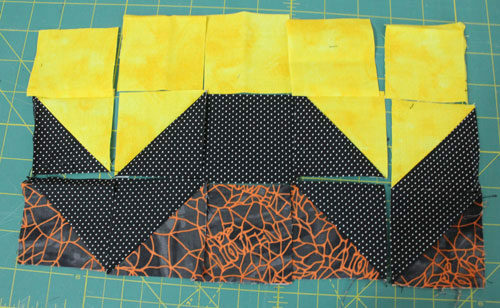 Cut out 2 2 7/8″ squares from the yellow fabric. Cut out 1 2 7/8″ square from the black fabric. 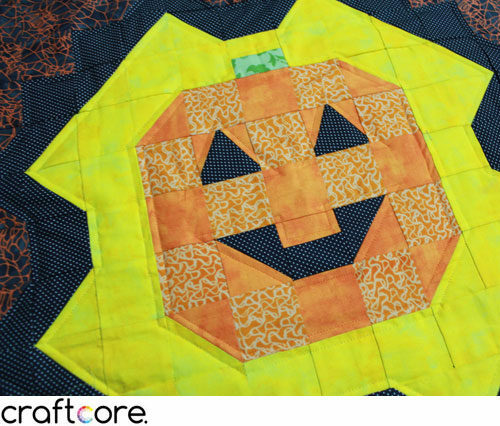 Cut out 4 3 1/4″ equilateral triangles from the orange solid fabric. 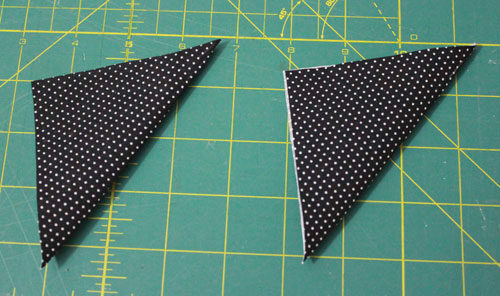 Cut out 2 3 1/4″ equilateral triangles from the black fabric. Tired of cutting? Let’s get sewing! 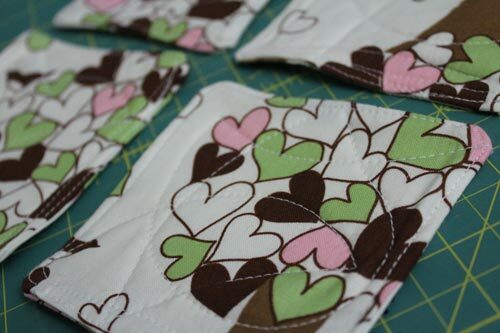 I recommend chain piecing whenever possible in order to make the process quicker. Pair 2 solid orange 2 7/8″ fabrics with 2 yellow 2 7/8″ fabrics, right sides facing in. Draw a line diagonally from one corner to the opposite corner. Stitch a 1/4″ from the marked line on both sides. 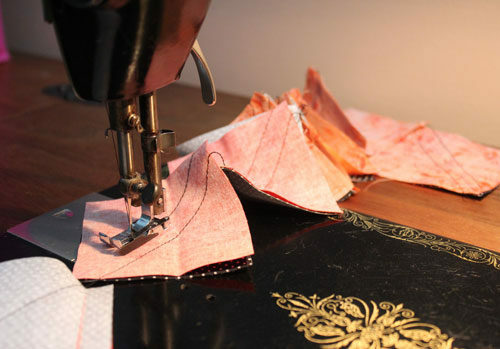 Once you’ve sewn them all, snip them in half along the marked line. Press the HST units open. 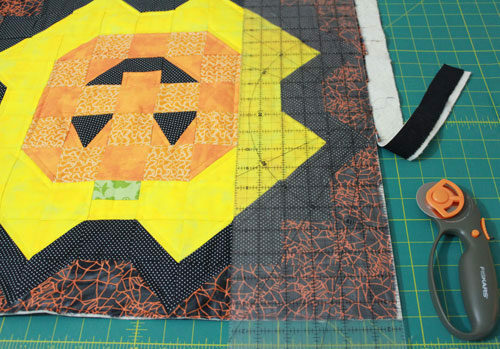 Pair one black and one solid orange 2 7/8″ square and repeat the above steps to create HST. 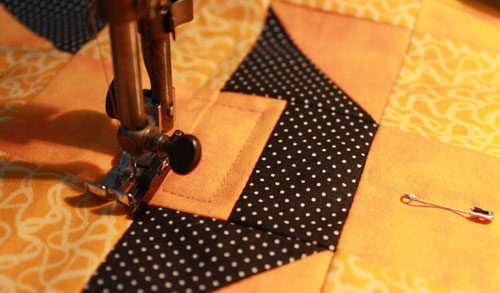 Pair one 1.5″x2.5″ orange patterned rectangle with one 1.5″x2.5″ black fabric rectangle and sew together. Press open to create the middle piece of the mouth. 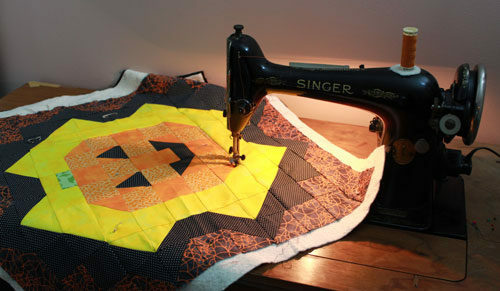 Sew together the two orange triangles to the black triangle as shown below. Once you press it open, Trim it down to 2.5″x2.5″ to create one eye . Repeat to create a second eye. Press each row. I like to alternate pressing to the left or to the right for each row so that when I sew each row, the seams nest making it easier to line them up. Press and admire your pumpkin! 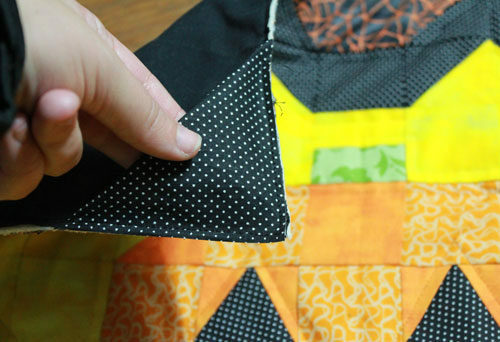 Cut out 4 2.5″ squares from the black fabric. Cut out 4 2.5″ squares from the grey fabric. 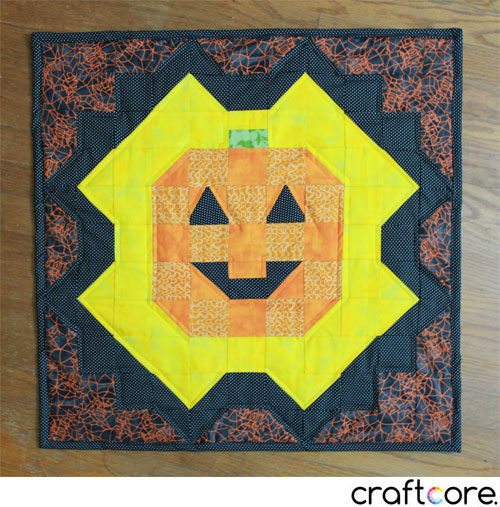 Cut out 8 2 7/8″ squares from the yellow fabric. Cut out 8 2 7/8″ squares from the grey fabric. 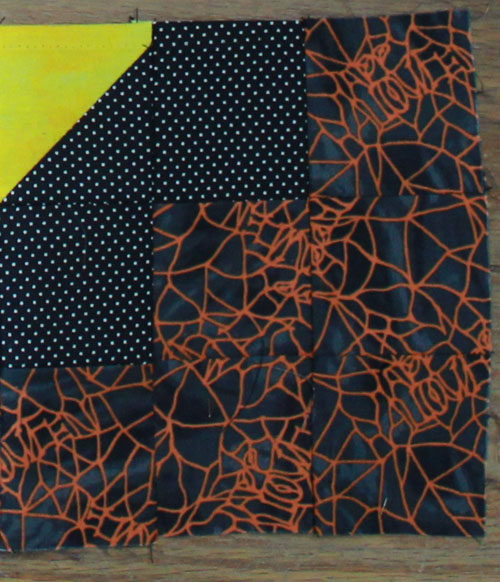 Cut out 16 2 7/8″ square from the black fabric. 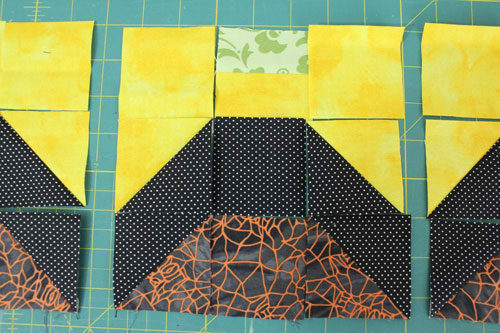 Cut out a 1.5″x2.5″ rectangle from the yellow fabric. 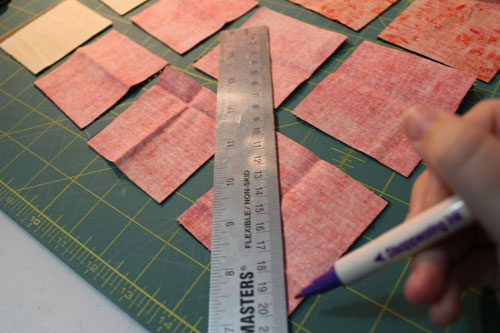 Cut out a 1.5″x2.5″ rectangle from the green fabric. Pair 8 black 2 7/8″ fabrics with 8 yellow 2 7/8″ fabrics, right sides facing in. Draw a line diagonally from one corner to the opposite corner. Stitch a 1/4″ from the marked line on both sides. 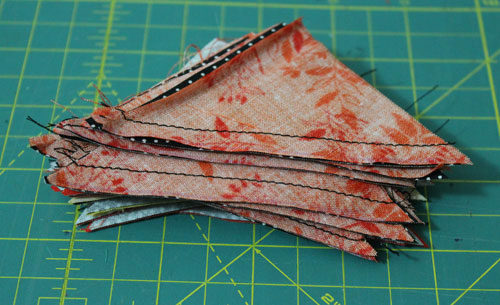 Once you’ve sewn them all, snip them in half along the marked line. Press the HST units open. Pair 8 black 2 7/8″ fabrics with 8 grey 2 7/8″ fabrics, right sides facing in. Draw a line diagonally from one corner to the opposite corner. 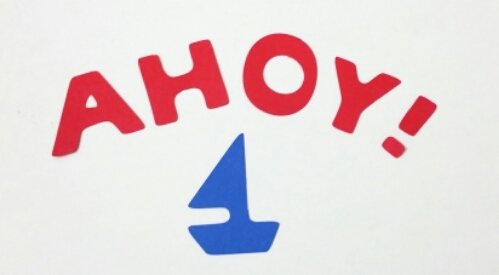 Stitch a 1/4″ from the marked line on both sides. Once you’ve sewn them all, snip them in half along the marked line. Press the HST units open. Arrange the pieces like this in rows. Sew together each row of 5, then sew those rows together. 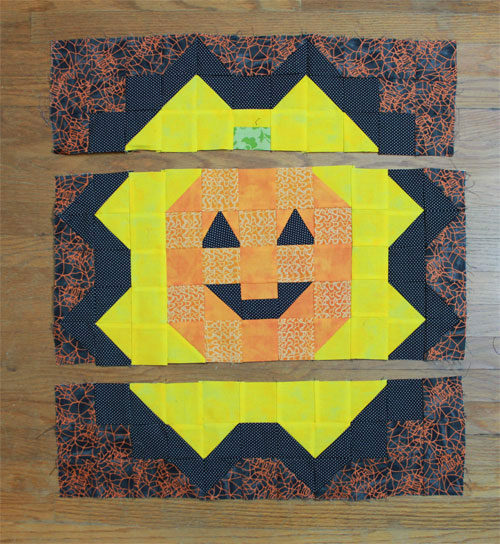 Repeat these instructions three more times, except for one block, replace the centre yellow 2.5″ square with the “stem.” Create the stem by sewing the long ends of the two 1.5″x2.5″ rectangles together. 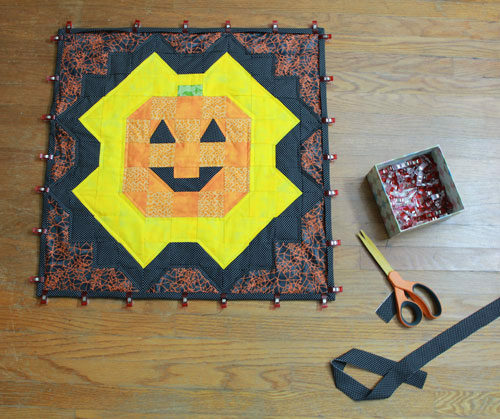 Cut out 8 2.5″ squares from the black fabric. Cut out 24 2.5″ squares from the grey fabric. Cut out 2 2 7/8″ square from the black fabric. Sew together each row of 3, then sew those rows together. Repeat the steps above three more times for the other corners. 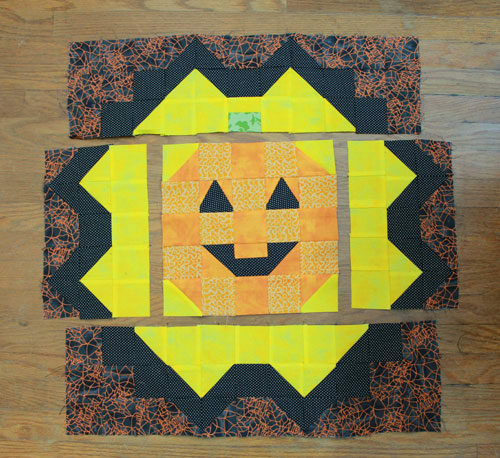 Sew together two Side units with the Pumpkin unit. Sandwich the quilt with backing fabric, batting, and the quilt top. 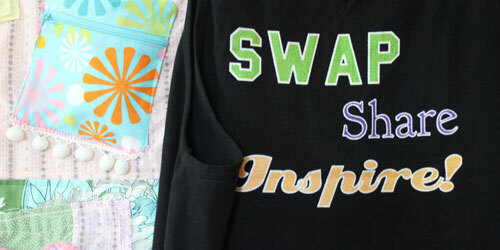 You can quilt your layers any way you’d like. 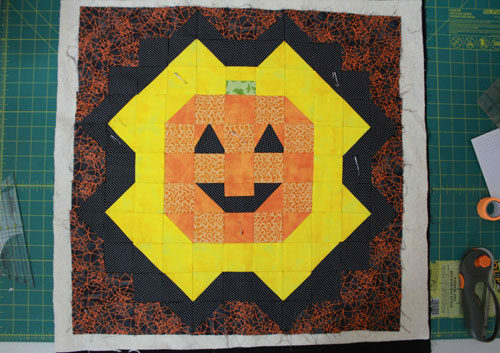 I sewed 1/4″ around all the details such as the face, the perimeter of the pumpkin, around the black border, and around the very outer edge of the quilt. Trim up the quilt! If you use a 6″x24″ ruler, you should be able to line up the ruler with the edge of the pumpkin as a guide since the border is 6″ finished. 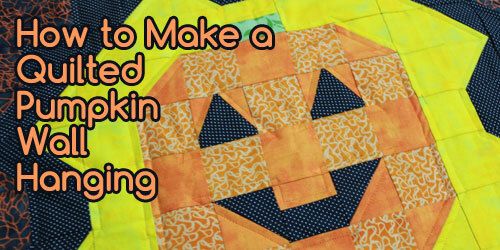 To make the quilt into a wall hanging, cut out a pair of 4″ triangles. Fold them in half diagonally. 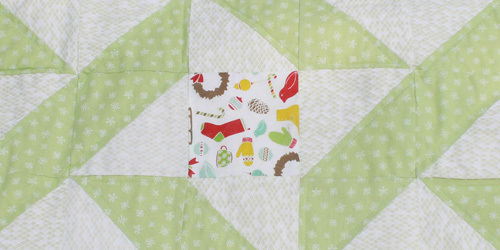 Pin the triangles into the top left and top right of the quilt and sew it into place close to the fabric edge. 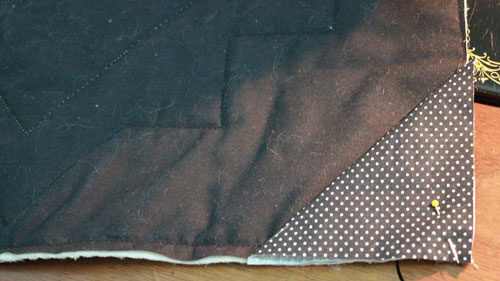 Attach and sew your binding to the quilt. Once you’ve bound it, the raw edges of the hanger will be caught inside the binding. 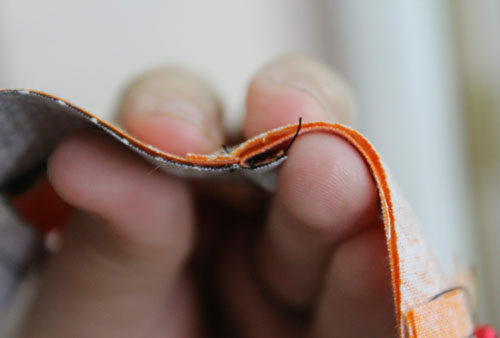 For tips on binding, read this guide. Thanks for taking the time to write this tutorial. Adorable! A project for next year.